Safety should always be considered when welding. Although the chance of injury lessens if welding is done properly, welding still creates hot sparks, metal, and sometimes water. Burns and other damage can result if you fail to wear the proper protective gear such as a helmet. Not sure which welding helmet you should look at? What should you consider when buying a helmet? In this article, we’ll share some of our favorite welding helmets and some things to consider when buying! Antra’s solar-powered auto-darkening welding helmet offers versatility and tons of features at a great value! This lightweight helmet is useful for all types of welding including TIG, MIG, MMA, or plasma and a variety of applications including grinding, cutting, and welding. The Antra AH6-260-000 features fully automatic power on/off, a knob to adjust sensitivity and delay settings, passive UV/infrared protection, and even a hard-hat adapter (sold separately). It also comes with six bonus exterior lens cover plates and one interior cover plate. The helmet runs on solar cell or two replaceable CR2032 batteries. This helmet measures 9 x 9 x 9 inches and weighs approximately 1 lb. The Antra AH6-260-000 also features a Power Off delay function where the filter stays on for ten minutes in dark locations before it goes to sleep. The package includes the helmet, one user manual, six exterior lens covers, and one interior lens cover. This heavily versatile helmet can be used with almost any welding application. Its budget-friendly price coupled with features such as variable shade adjustments, delayed Power Off option, built-in passive UV/IR protection, and grinder switch make it a phenomenal welder’s companion. You really can’t find a better deal than this! One thing to keep in mind, however, is that the helmet is made of thin plastic. It may not hold up to heavier or industrial welding applications. So this helmet may not be good in the workplace. Additionally, it’s not recommended for overhead welding due to the thin material. Consumers know and trust the Jackson brand for their safety and comfort features in their products. The Jackson 46131 is a lightweight auto-darkening helmet that’s sure to keep you safe as you’re welding or grinding. The Jackson Safety 46131 offers variable shade (9-13), a wide viewing area that measures about 4 x 2.5 inches, sensitivity and delay adjustments to suit your needs or preferences, four auto-dimming sensors for more precise adjustments, and user-friendly digital controls. The auto-darkening filter (ADF) helps welders adapt to different working environments with different levels of light. This works by the welder controlling the lens shade with options to adjust it as needed. This helmet measures 14.5 x 10.2 x 9.2 inches, and it weighs about 2 lbs. This helmet runs on 1 lithium-ion battery and is made of nylon. Choose between grind and weld modes to use it with a variety of applications including MIG welding, TIG welding, and arc welding. The Jackson Safety 46131 also complies with ANSI Z87.1 standards and is CSA compliant. This packaging contains the helmet. The Jackson Safety 46131 is perfectly suited for a professional environment. It complies with international safety standards so you can be sure it will get the job done and protect you from harm. The four independent sensors, sensitivity and delay adjustments, and the user-friendly controls ensure that you can work precisely and efficiently without having to worry about making costly mistakes due to lack of precision. The auto-darkening features enable you to work in different environments as well! You can’t go wrong with this durable helmet. some welders might find it too f short for them, causing the neck to be exposed when the lens was flipped down. If you’re looking for a welding helmet with a little more “flair,” look no further than the Dekopro Solar-Powered Auto Darkening helmet. This sleek, stylish helmet also provides sufficient protection to keep you safe as you weld or grind. It also meets several international safety standards so you can protect yourself while looking great at the same time! This Dekopro helmet features eye protection with an auto-darkening filter that quickly changes from light to dark and offers UV/IR protection according to international safety standards. You can also adjust manually adjust sensitivity and delay settings depending on your needs. The helmet runs on a solar-powered battery and lasts up to approximately 5000 hours. The Dekopro helmet measures 12.7 x 9.4 x 7.6 inches, and it weighs almost 2 lbs. 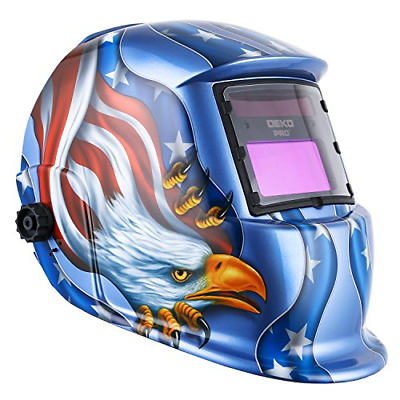 This helmet works well with a wide range of welding processes including MMA, MIG, MAG/CO2, TIG, and plasma welding as well as arc gouging and plasma cutting. The lens allows for a wide viewing area so you can see clearly at different angles. The packaging includes the helmet, an adjustable headband, and a user manual. You can’t go wrong with the Dekopro helmet. It meets the best of safety standards, and its versatility is unmatched. Its durability works well in heavy industrial environments, but it comes at a price to fit almost anyone’s budget! Adjust the sensitivity and delay settings to match your specifications, and let the helmet take care of protecting your eyes against burns, glares, lights, and debris! You might notice, however, that sometimes the helmet doesn’t stay up when you flip it up. This might cause you some annoyance. Additionally, although it works in a heavy industrial environment, we recommend it for beginners and apprentice welders instead of for someone who’s been welding for years. So if you’re a seasoned welder, you might want to look at something a little more expensive. The Tacklife PAH03D auto-darkening helmet combines comfort and safety into a lightweight and a durable piece of headgear. Its optical quality surpasses other welding helmets. This makes for a powerful helmet at a reasonable price. One of the key things that separate this helmet from others in this list is its top optical grade 1/1/1/1. The high grade provides maximum protection for your eyes. The Tacklife PAH03D also uses a shade 3 light state which enables users to view their projects and surroundings compared to a normal shade 4. Lastly, this helmet comes with four sensors, a large viewing area, quick darkening time, and an adjustable headband. This helmet measures 11.8 x 7.9 x 9.4 and weighs just over a pound. 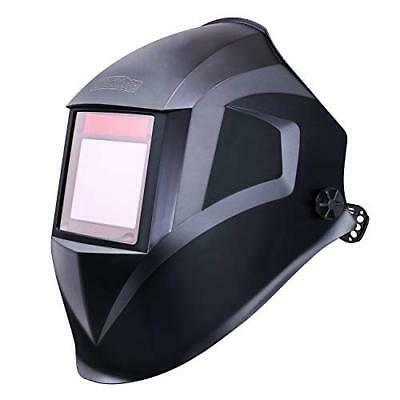 Solar- and battery-operated, the Tacklife PAH03D offers UV/IR protection, reduced eye strain, and works with a variety of welding applications and grinding. The packaging includes the helmet, six cover lenses, black storage bag, and a user manual. The product also includes a 24-month manufacturers warranty. This highly-rated helmet ranks among the best of the best. Its ergonomic design ensures you’re comfortable as you’re wearing it. 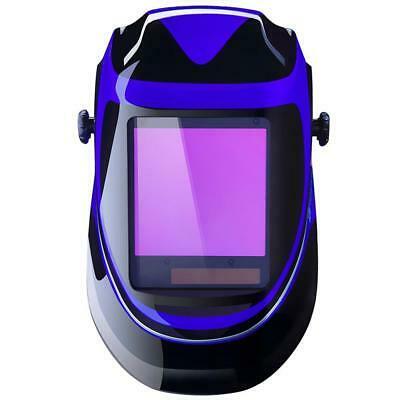 It also protects you from damage related to welding activities with UV/IR protection, a high-grade optical rating, and an auto-darkening filter. This is a great value for a durable, comfortable helmet. Unfortunately, sometimes it falsely triggers under bright lights such as LED or fluorescent lights. 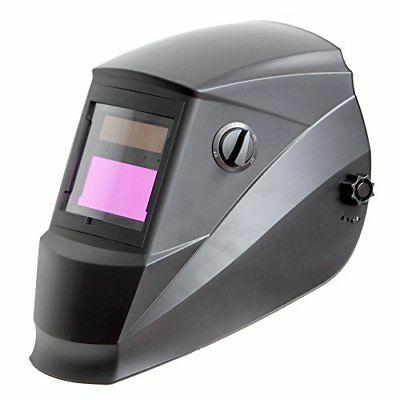 This attractive auto-darkening welding helmet from Dekopro offers versatility and a large number of features. 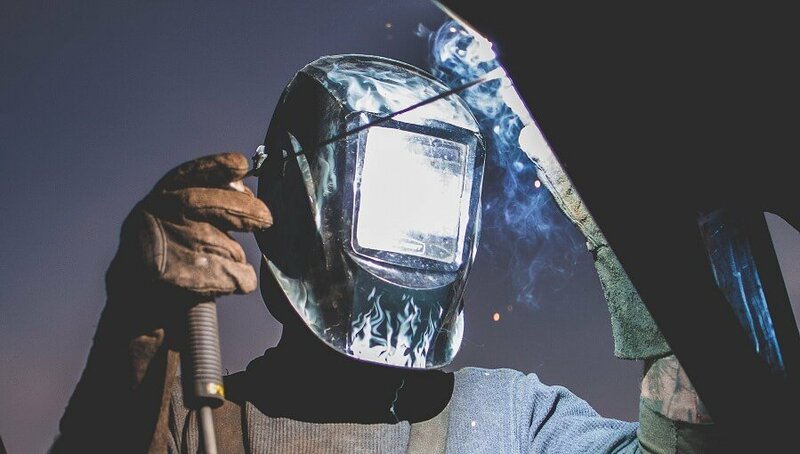 Coupling optimal eye protection with a wide view, this helmet balances value and usability to make this a great option if you’re looking for a welding helmet. The auto-darkening feature almost immediately changes from light to dark once a light is detected. It also offers protection against UV/IR radiation. The auto-darkening feature allows you to work in a variety of environments. It’s even sturdy enough to work in a professional environment such as a factory or a manufacturing facility. This helmet measures 12 x 9 x 8 inches, and it weighs just over 2 lbs. This Dekopro helmet also features manual sensitivity and delay settings to enhance precision and accuracy in your work. The packaging includes a welding helmet, an adjustable headband, and a user manual. This welding helmet works very well for just about any welding application you can think of MIG, TIG, and even stick welding. You can also use it for grinding. Its manual adjustment options, safety features, attractive design, and auto-darkening feature make this a welding helmet you should consider for adding to your toolkit. Unfortunately, sometimes the shade power might fluctuate. If this is the case, you might be able to return it for a different one. What Is the Best Budget Welding Helmet? 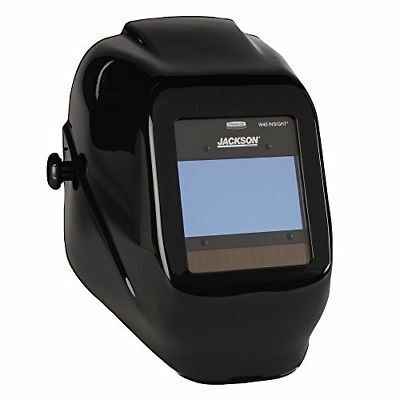 Our favorite budget welding helmet is the Jackson Safety 46131. Its combination of safety features which adhere to international standards and excellent features make it a great value. Although it has a few cons in that that headgear might slip off or might not fit properly, by far and large, it offers plenty of useful features and works for both professionals and hobbyists. How Does a Welding Helmet Work? What Does a Welding Helmet Protect You From? A welding helmet protects you from heat, flash burns, UV light, sparks, and infrared light. It can also protect you from stray debris that might come off in the welding process. How Long Do Auto-Darkening Helmets Last? Many auto-darkening helmets’ batteries are rated to last approximately 5000 hours. Of course, this depends on how often you use your helmet and for how long. Many welding helmets contain batteries, usually lithium ion, which are powered by solar panels. A problem with this, however, is that once the battery dies, it sometimes cannot be replaced. If that occurs, then the auto darkening feature on many helmets will not work. In this case, you might be required to purchase a new helmet. Almost all of the helmets showcased in this list fall within a reasonable budget. A general rule of thumb, however, is that it’s almost always worth it to purchase a more expensive helmet since they’re more likely to be durable and reliably constructed over significantly cheaper options. That’s not to say budget options aren’t worth investigating – just make sure to do your research to find a helmet that fits your needs. Most helmets weigh between 1 and 2 lbs. If you plan on regularly using your helmet, consider purchasing a lighter helmet. This will ease the strain on your neck as you’re welding while still providing comfort and safety. You might consider a heavier one if you plan on only doing a few short welds at a time. Above we discussed that adjustable delay and sensitivity controls offer you more precise control over how much light will trigger the darkening features and how long a lens remains dark after a weld. These features are useful if you’re looking to get the most accurate weld possible or if you want to protect yourself against any damage. Additionally, some welding processes don’t emit as bright of an arc in the process, and higher amperage arcs might still emit damaging rays even after the light dissipates. Viewing size is usually based on personal preference. If you plan to do a lot of out-of-position welding, consider finding a helmet which gives you a wider, more open viewing size. If you’re not too concerned about out-of-position welding, you might consider one with a more narrow viewing size. The more industrial a helmet is, the more sensors it will have. Ideally, you’ll find a helmet with four sensors (some have two). More sensors equates to more coverage as you’re welding to give you as much protection as possible. A welding helmet might be one of the most important purchases you’ll make as a welder. The right helmet will protect you from damaging light, rays, and heat as you’re welding. We provided some tips, tricks, and things to consider when finding a helmet and shared with you some of our favorites! We hope you found this article informative and useful as you’re researching the perfect welding helmet for you! I hope you found our Best Budget Welding Helmet article useful. Do you have any other questions about any other Welding Helmet brand?